Saugeen River in Southampton, Ontario, about 1 km from its mouth at Lake Huron. The Saugeen River is located in southern Ontario, Canada, flowing generally north-west about 160 km before exiting into Lake Huron. The river is navigable for some distance, and was once an important barge route. Today the river is best known for its fishing and as a canoe route. The river's name comes from an Ojibwa language word Zaagiing, meaning outlet. 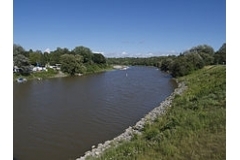 The river is split in two for most of its length, with the South and North Saugeens both being formed from a number of smaller branches starting south-west of Owen Sound. The two main branches meet about 24 km south-southeast of its exit into Lake Huron, at Southampton.